so I hope you'll feel welcome, as I show you around. Today, I'll be sharing from several areas of our home on the main level. We have a newer walkout basement Open Concept home that we've lived in 2 years, but this is our 3rd Christmas here. The Entry, Dining Room and Living Room are basically in one large space. 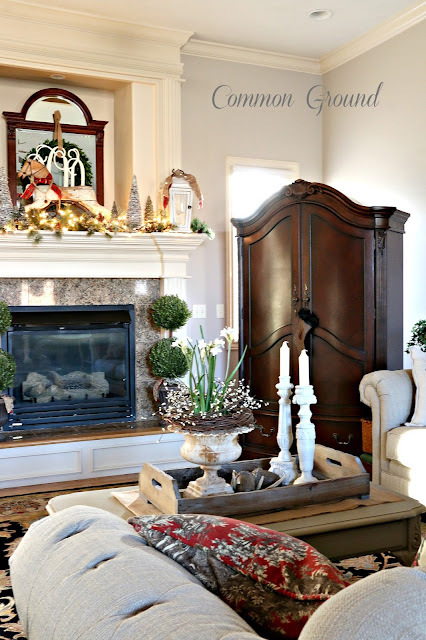 It's easy to decorate, but at the same time, it's important that I have a theme and a plan! One of the ways that I keep a look going is to use wired ribbon to coordinate through all the rooms. 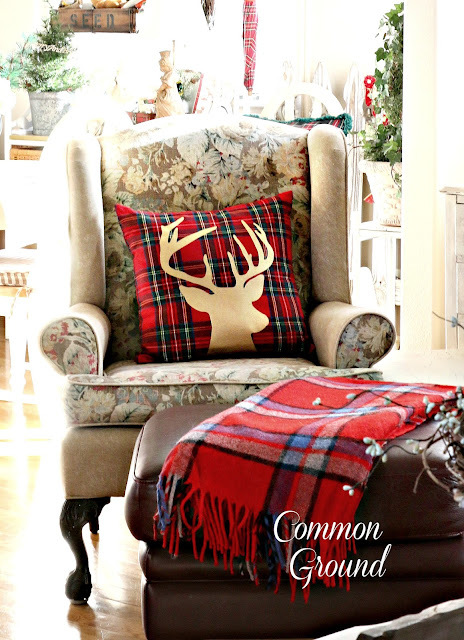 This year I found a fun metallic gold polka-dot on a burlap/linen look background, that I paired with my favorite Christmas accent, Stewart Red Tartan Plaid. 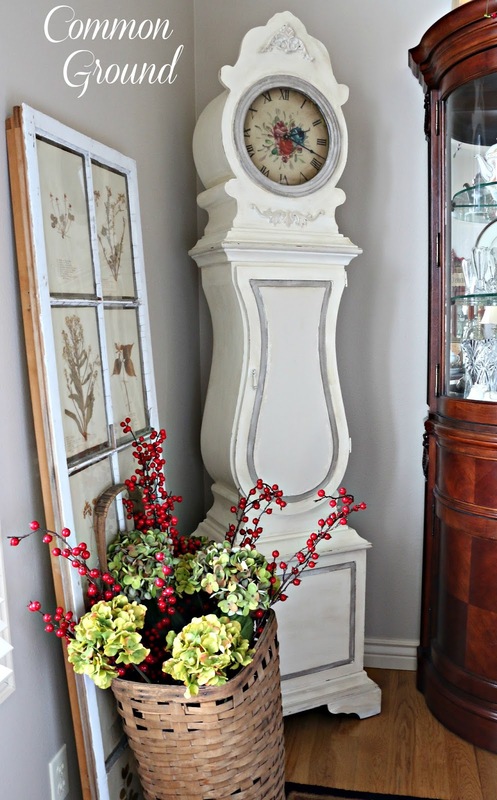 Here in the Entry, I kept things in neutrals with just the gold polka-dot. 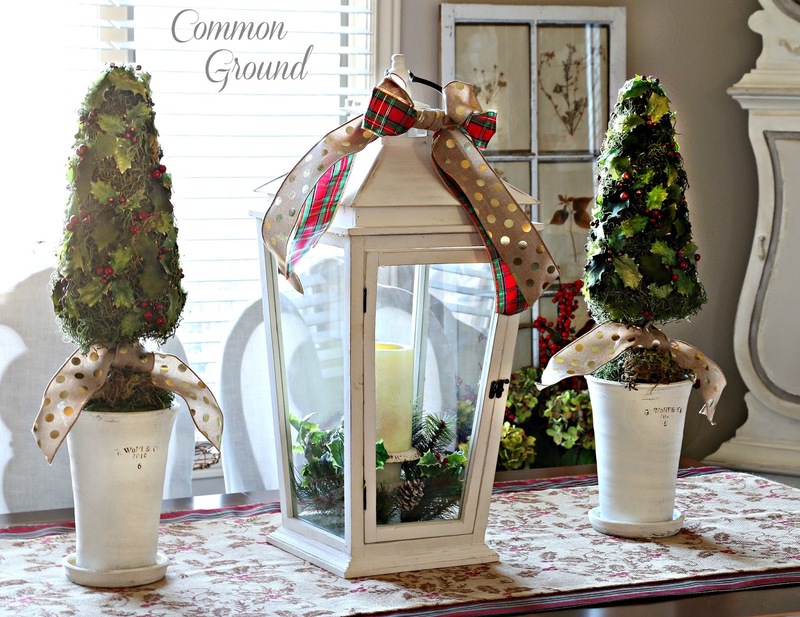 I used it to hang the Boxwood Wreath and to adorn the vintage look tree in an iron urn. 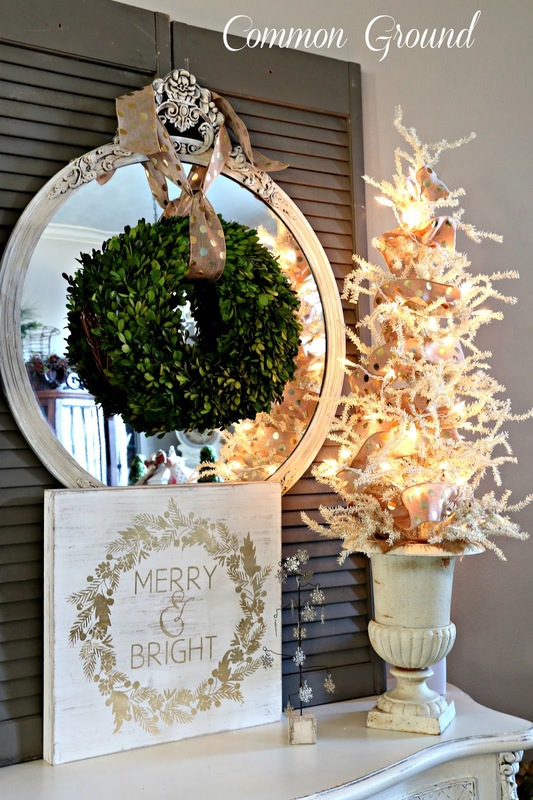 I found the "Merry and Bright" wooden plaque at Hobby Lobby. It really stated the message I wanted to share this Christmas. table runner and decor here in the Dining Room. 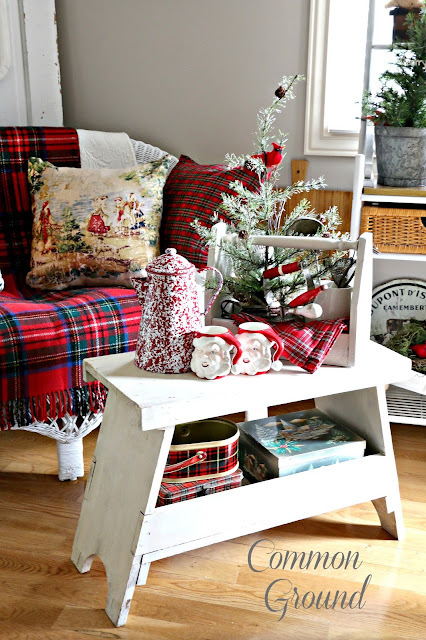 My first plan when thinking about Christmas Decorating, was to find a Red Tartan Plaid fabric piece to use as a base for my burlap printed Holly table runner. I found a large tablecloth instead, and just folded it in two lengthwise. 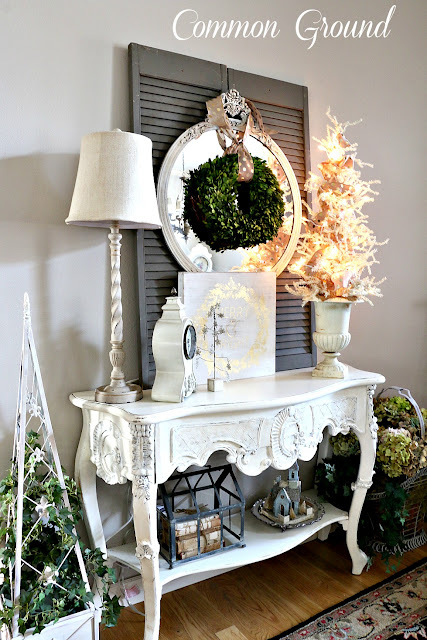 This year I used a large white lantern from Pottery Barn and Holly Topiaries that I made many years ago, in Restoration Hardware pottery by Guy Wolff. I love the high ceilings in this house, but anything that's used as decor on this table has to be good sized, otherwise it's lost. An antique market basket on wheels holds seasonal faux floral stems. 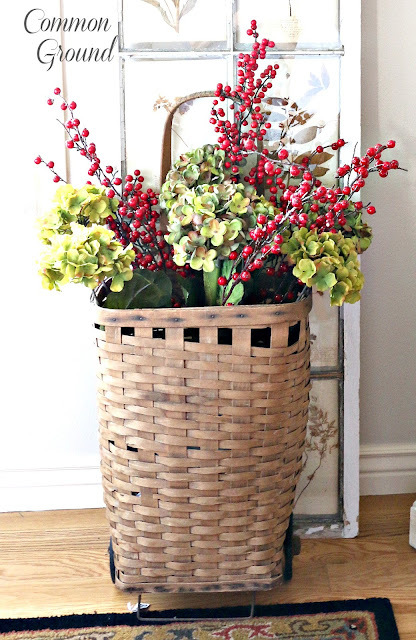 I use Hydrangeas for every season, and here they are paired with Red Winterberries. 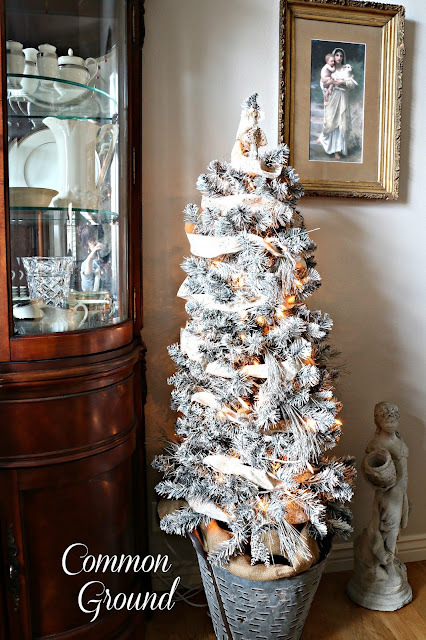 I didn't use the large white tree this year, so this smaller Entry tree is standing in. It's wrapped in a White Printed Burlap Ribbon sitting in my galvanized olive bucket. that's the staircase as the room divider. I have a love/hate relationship with this fireplace. 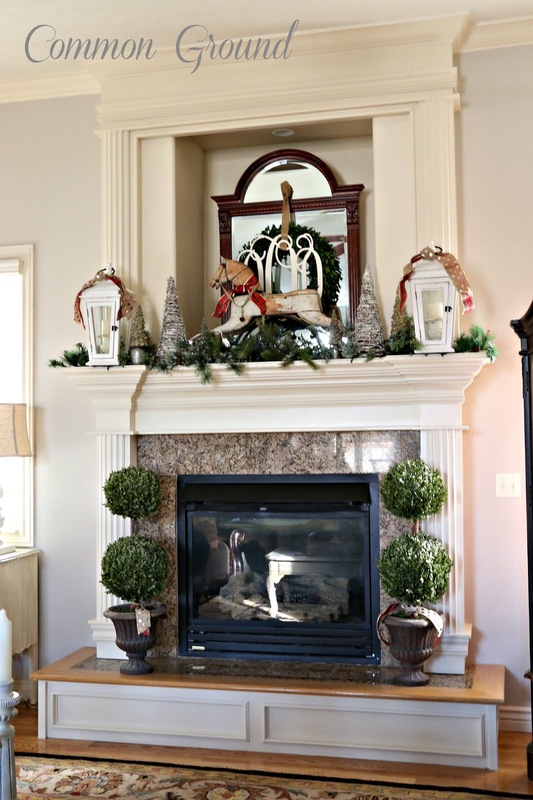 I love having a fireplace, but this is a little bigger than I would have designed. I'm a small person, so whatever I do up here has to be done on a step ladder. And like the Dining Room, it has to have some "heft", otherwise you can't see it. 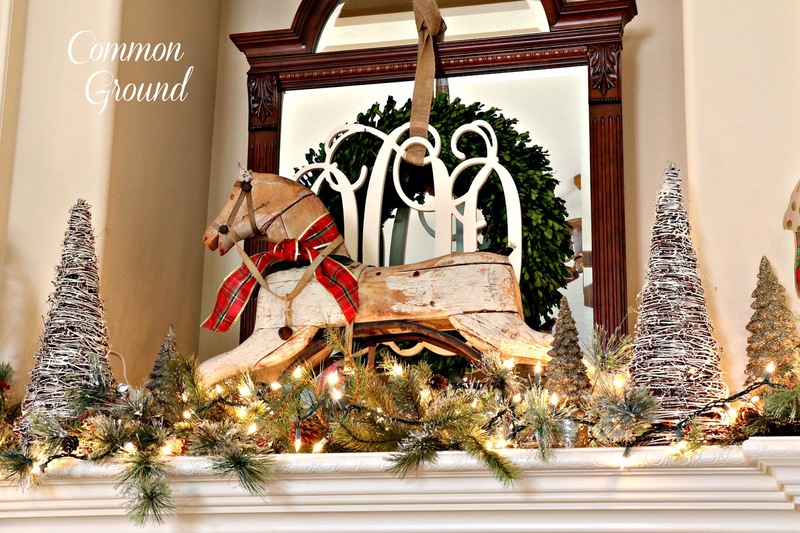 This year I wanted to use my Antique Rocking Horse as the focal point. 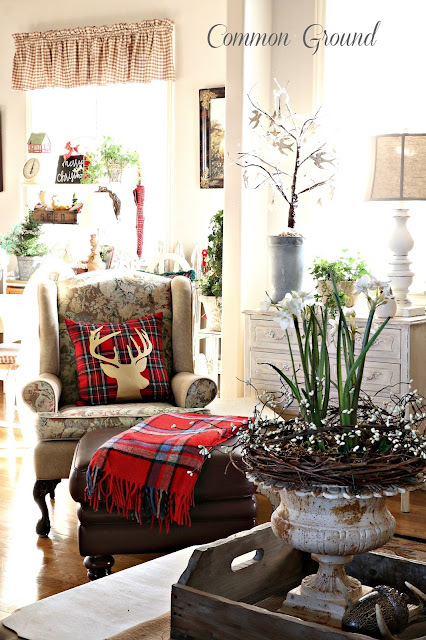 He's adorned with the Tartan Plaid Ribbon, as are the smaller Pottery Barn Lanterns. I really do LOVE Plaid, and what's better than just Plaid for Christmas? A Gold Metallic Reindeer ON Plaid, of course! that has become my favorite spot in the house for decorating. that I'll be sharing right before Christmas. 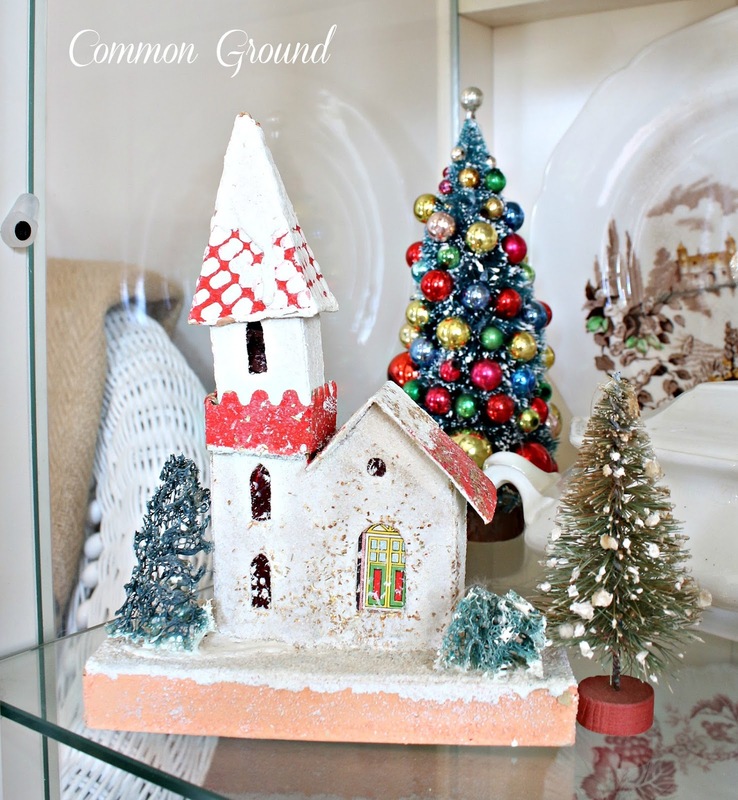 holds my seasonal vintage decorating odds and ends. Each Season and Holiday finds it's way to the Baker's Rack for display. 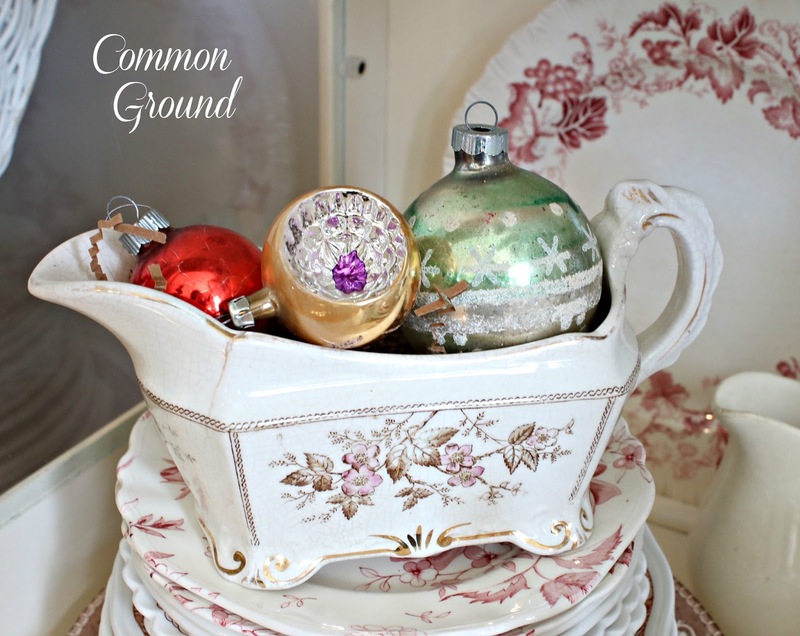 My Kitchen China Cupboard holds my Brown and Red Transferware dishware. I don't have "sets", just orphaned bits and pieces of various patterns. some of my collection of old Putz Houses and Churches. Our previous home had a small Sunporch that held my wicker settee, chair and Baker's Rack, but since I don't have one at this home, I'm enjoying them here in the Sitting Area. My love for Plaid is right at home here on the wicker, and I use this old cobbler's bench as a small coffee table/foot stool. If you're new to my Blog, I hope you'll come back to visit. There are several ways to stay up-to-date on my sidebar. I'll be sharing much more of these areas in future posts. Oh Debra what a glorious tour! 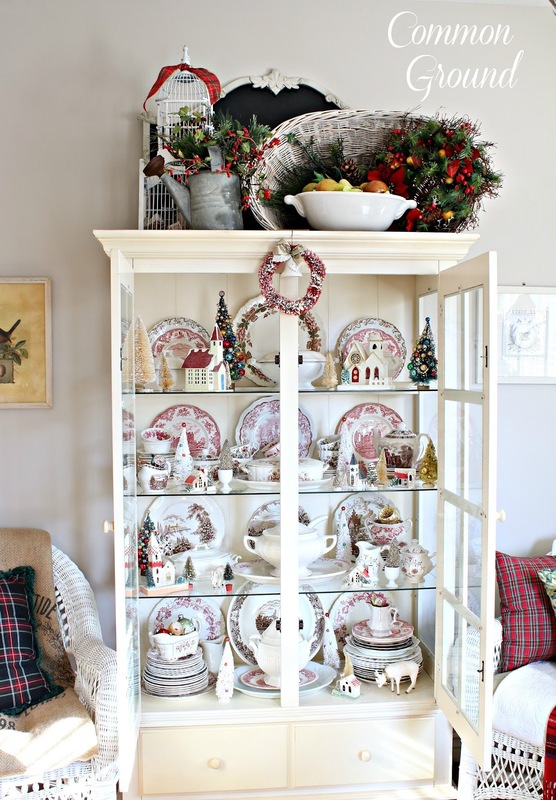 I adore all of the touches of plaid and your hutch filled with your collection of transferware is just stunning. I'll see you tomorrow for the party! 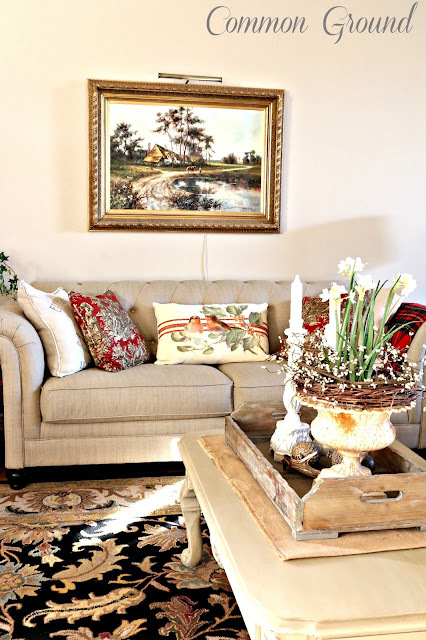 Your home looks beautiful, Debra! You have a way of putting things together that is so charming and fresh! I love your plaid, too! 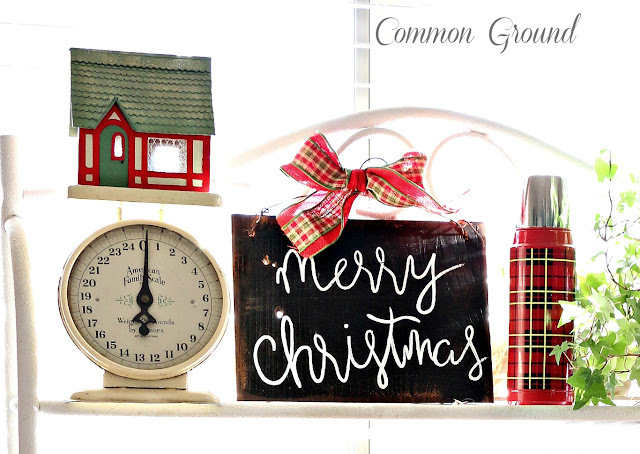 Hope you're having a wonderful holiday season! Debra Debra Debra...wow...what else can I say but simply breathtaking! 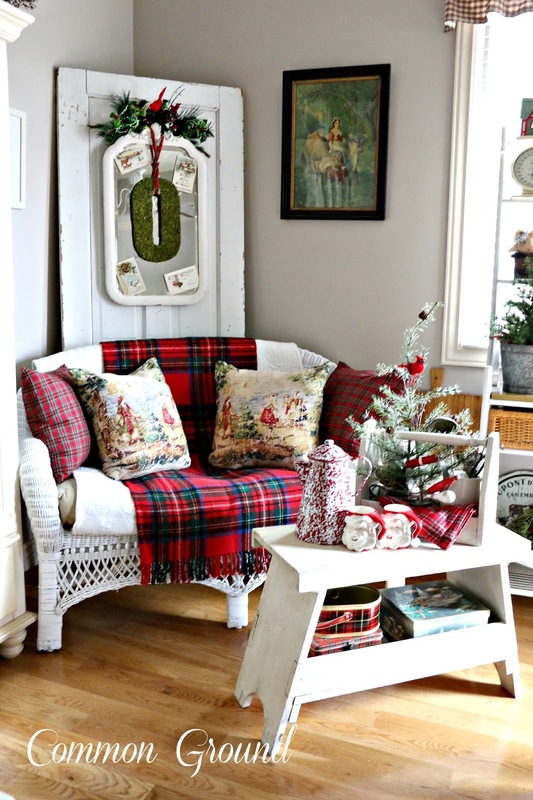 I too this year found myself incorporating tartan plaid in my decorating for Christmas. Now I know I am in excellent company. Love your pops of red to bring in a beautiful festive feeling. Wishing you a wonderful holiday season...ENJOY! Oh my, everything is so beautiful. I am drooling over that horse on the mantel and all of your beautiful plaid. Thanks so much for joining the tours this year, what a treat. Just gorgeous, Debra! You always have the BEST throw pillow, too :) And I love how you put the wreath around the paperwhites. It all looks lovely! Hi Debra! Your home looks so beautiful! You have such beautiful things! Debra so pretty! 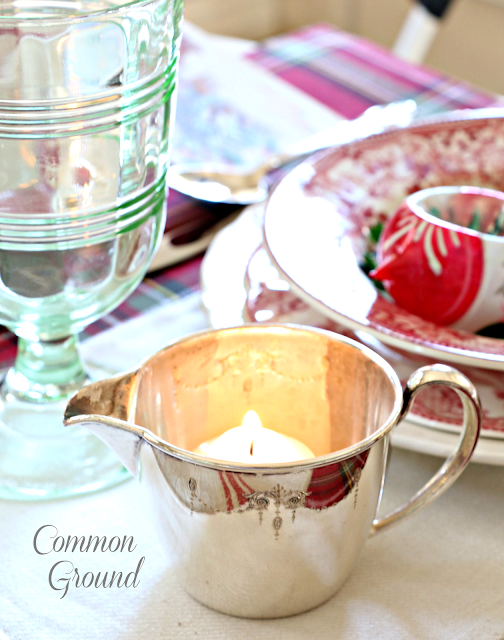 I LOVE it all...but Swoon over Brown and Red Transferware dishware. Merry Christmas! Your home is just majestic Debra!!!! 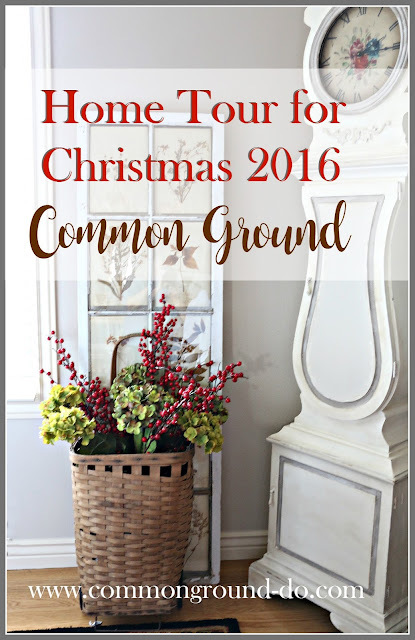 You've thought of every little detail and I love how every nook and cranny of your home is just full of Christmas Inspiration! So honored to share the home tours with you dear! CHEERS! Everything looks so beautiful, Debra. Love all your magical touches. Enjoy your week. So cheery! You have been busy. 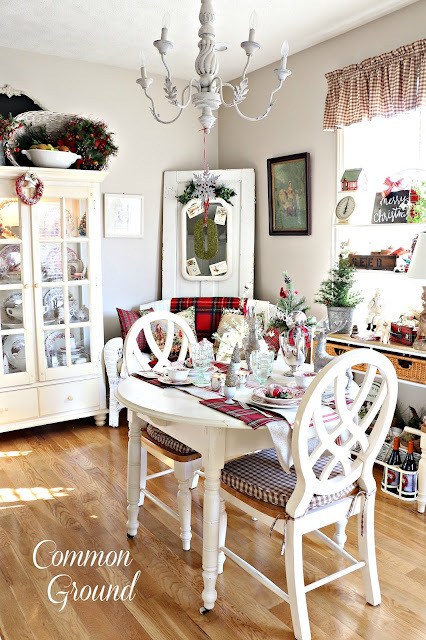 Love the kitchen china hutch! I am so glad you are up for the decor crazy this year, Debra. I love it all, and am equally mad for the plaid. Your kitchen sitting area is my favorite, too, I think. 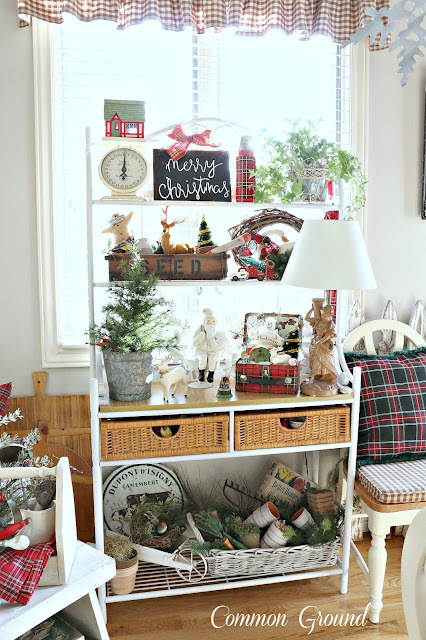 It reminds me of how I love decorating in my sunroom. It really shows your personality and love of vintage. Have a merry and bright season! 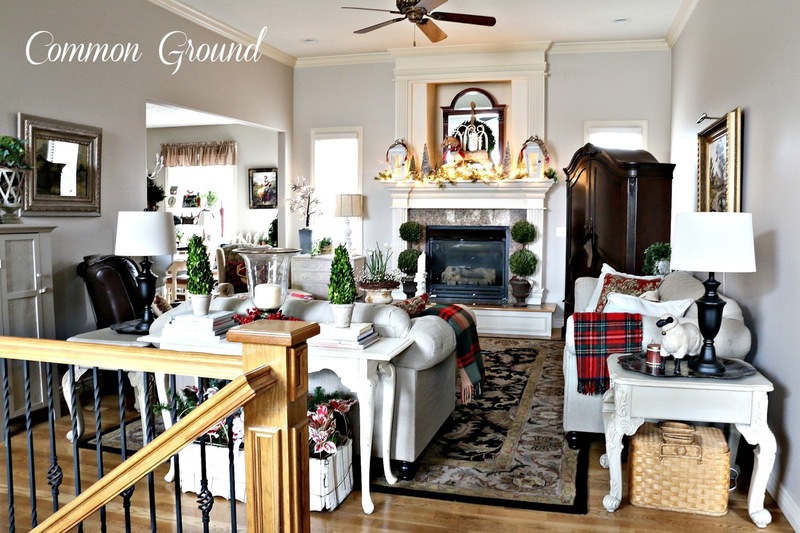 Debra- you have created christmas magic in all of your homes. love all your details, things you have had and that are special that you have placed throughout. happy holidays to you and your family. Hi Debra! Your home looks so festive and so pretty. 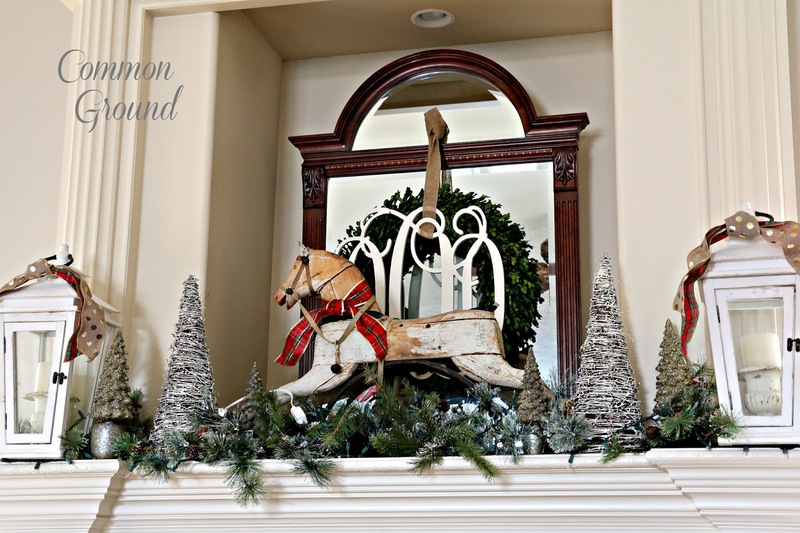 You have a done a fabulous job spreading Christmas cheer throughout your home. A very happy holidays to you and yours! Debra, your home is beautiful all dressed up for Christmas. 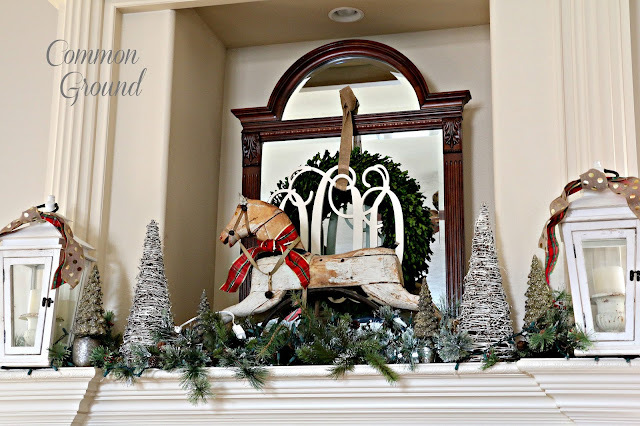 You know I love your cupboard, and this time, your mantel was the one that got my eye with that pretty rocking horse! Happy Holidays! Oh my goodness, everything is just beautiful, Debra! Your home looks very cozy and inviting. Such a pretty Christmas tour Debra! I really like how you styled your fireplace and my favorite part is all the plaid :). I hope you have a Merry Christmas!!! 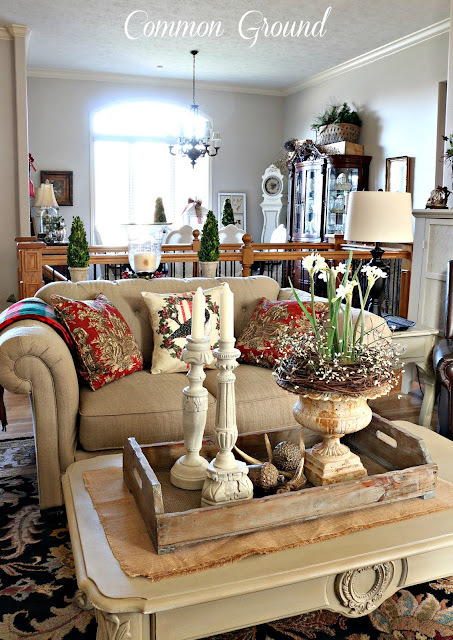 I love all of your special touches...and for some reason the coffee table vignette speaks to me the most! Merry Christmas. 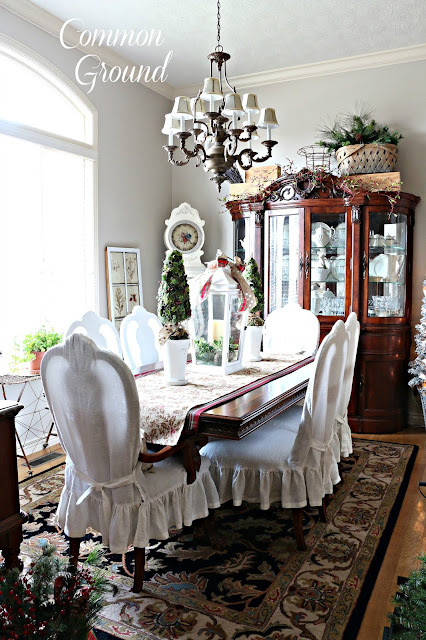 I love everything about your blog..... thank you.... dining room is lovely! Pretty tour, Debra and oh, I want your rocking horse. One of these days I will find the perfect one that doesn't need me to take out a loan. Debra, Your holiday home is just beautiful. I am sure you spend such wonderful evenings relaxing in that warm family room or morning coffee on that wicker draped in plaid. merry Christmas!